In this quick tutorial, you will learn how to start sending newsletters with JungleMail for Office 365. 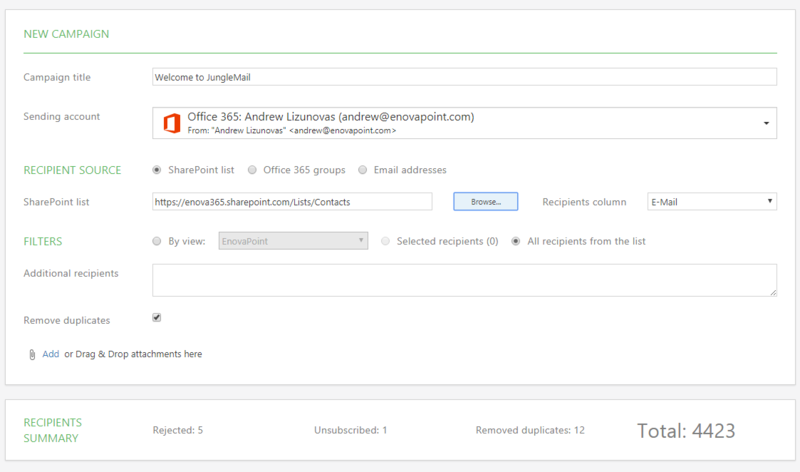 When sending newsletters in JungleMail for Office 365 you have total control. You decide what your email looks like, how personalized it should be and the exact time or times that it should be sent to your recipients. 1. To begin, navigate to the contact list that includes the recipients you want to email. 2. Select the recipients that you want to include. If you want to include all the recipients in the current view, do not select any; the entire current view will now be used. 3. Run the app by clicking the JungleMail 365 button in the ribbon. A new JungleMail newsletter window will now pop up. In the Recipients tab, you can edit all recipient-related information. Campaign title. Give your new campaign a recognizable title. (In the example below we chose Welcome to JungleMail ). Sending account: here you can select the account you are sending from, or simply add new accounts. In the 'Recipient list column' drop-down list, select the SharePoint list column containing e-mail addresses of the recipients. (This is automatically selected when opening a new campaign). Additional conditions allow you to filter your recipients according to SharePoint Views or SharePoint list conditions. If necessary, you may also specify additional recipients of the current group e-mail in the 'Additional recipients' section. In the Recipients Summary, you have a quick overview of your campaign's recipients. After you have selected all the intended recipients and have finished setting the necessary filters, click Next. 4. You can now select an existing template. If you are feeling creative you can start from scratch and build your own. To open the easy-to-use Drag & Drop Builder you should select the Drag & Drop Templates tab. Here you can choose an existing template or an empty one. The builder lets you create original, colorful email messages, simply by dragging and dropping text boxes and images. In other words, this means that HTML code skills are no longer required to create beautiful and effective campaigns. Wonder what your email will look like whilst you are busy editing? Click on Preview to get an impression of what it will look like on desktops and mobile devices. 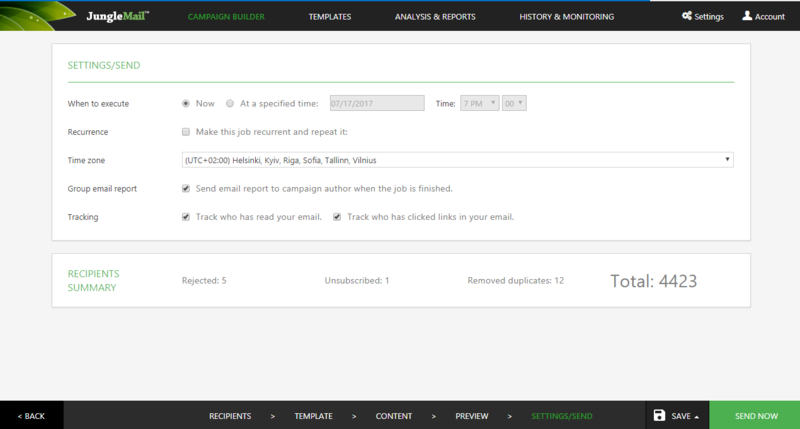 From the Preview tab you will also be able to send a test email to yourself. Once you have finished creating your newsletter, click Next again. In the When to execute field you can indicate whether the message should be sent immediately or at a specified date and time in the future. In the Recurrence field you can set the campaign to repeat itself at preset times. If the checkbox in the Group e-mail report field is checked, the job author will receive a report after the campaign has been sent. By checking the boxes in the 'Tracking' section you can track how many recipients opened your email and clicked the links in it. Once you are finished configuring all options, you can click Send now. 6. You will now be redirected to the History & Monitoring tab. Here you will see your current campaign among the running and scheduled jobs. You will have to option to edit, cancel, pause or copy the campaigns in this tab. 7. After the campaign has been sent to all recipients, it will be placed in your History. You can later re-use the recipients' list and/or the content of the sent campaign. 8. Finally, in the Analysis & Reports tab you can check the tracking statistics. Here you will see the total number of e-mail messages sent, the number of the recipients who opened your email message, clicked on the links, as well as the number of the recipients who unsubscribed from your list. You can filter the results or export them to csv .